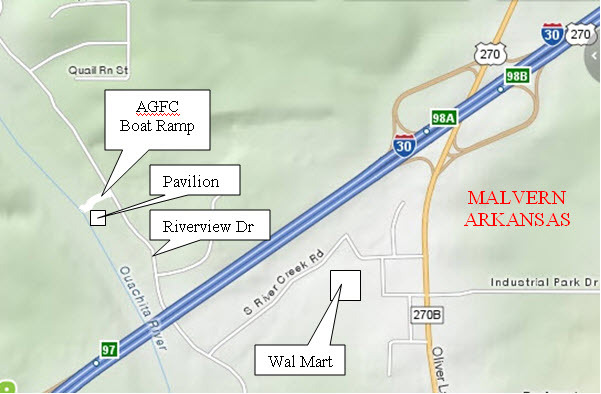 The Ouachita River between the AGFC boat ramp below Remmel Dam (forms Lake Catherine in Hot Springs) and the AGFC boat ramp at Malvern offers some excellent gentle paddling when electricity is NOT being generated. You can check the planned flow releases at http://www.entergy.com/operations_information/hydro/flow_releases.aspx and and information about what is actually happening at the present time at http://waterdata.usgs.gov/nwis/uv/?site_no=07359002. A water level of 3.0 feet or less on the gage indicates NO generation is taking place. At this level the river flows gently where flow is detectible; there are a couple of long pools which may appear to have no current. The water is clear and cool year round, allowing you to see the bottom in the shallow areas. Mussel shells are plentiful as are interesting rock formations. Some impressive rocky hillsides are visible about midway through the five miles to Malvern. Keep your eyes open for fish as you paddle. If you paddle up the mouth of Stone Quarry Creek which comes in from the left in the middle of a large sweeping bend to the right about 2 miles into the trip, you will probably see many large fish. The quieter you paddle up the creek, the more fish you will see, possibly including some large gar. Back in the Ouachita, there are several spots where the water is swift, some with rocks to dodge. You may be challenged by a maze of rock outcrops a time or two. Just before arriving at the take-out ramp in Malvern there is a river-wide rock outcrop that forms a small waterfall. The best place to pass over or through the rock is on river left, fairly close to the left bank. You can even pull over to the bank just upstream of the fall and get out to examine the fall and select your preferred spot to pass. 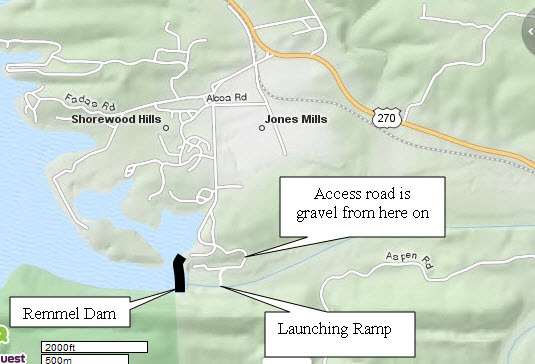 There is a sidewalk from the fall to the AGFC boat ramp if you choose not to go over the fall. A map showing the take-out at Malvern is below. There is paved parking and a bathroom adjacent to the boat ramp in Malvern; the bathroom is closed during the winter. Take your time and enjoy this outing. Y0u can paddle this section of the river when normal generation is taking place (up to 6.5 on the gage), but the current is swift in a lot of places and there will be few, if any, places to stop safely. Be careful at that level and be sure to paddle with several other skilled paddlers who can help you retrieve your gear in the event of a tip over. Rainfall can raise the water level to an unsafe level (above 6.5 on the gage); so can flow releases designed to help lower Lake Ouachita below the flood pool. Always check the gage and the planned water release schedule before making the trip. Below is a video showing this section of the Ouachita River. 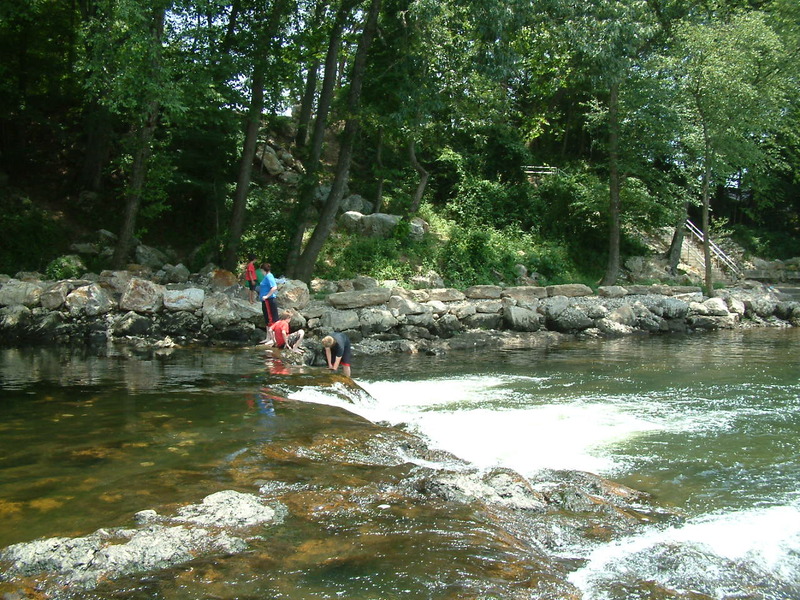 Just bring your sun screen, radio, water shoes, and a towel and get ready for a great day in the Arkansas outdoors.The rocky crags, the wildlife, the gorgeous houses, the cool water, and the fellow floaters makes this a great way for the family to spend a hot summer day. We were there on July 25, 2015 and found at least 300 park visitors and a large water slid for the kids too. Take the I-30 Malvern, Arkansas exit and follow the signs to the River Park. ( Near Wal-Mart too) There are several canoe and tube rental places in Benton, Arkansas that serves this area. Thanks for the well written comment, Martha. That part of the Ouachita is a summertime joy!